Of course, even the Mediterranean diet can sound like just another trend — especially in our current political moment, when so many are dismissive of anything with a European flavor to it. Recent news doesn’t help, either: This past month a study on the diet, originally published in 2013 in The New England Journal of Medicine, was retracted, revised and republished because of errors in randomization. Some took this as evidence that the diet itself was suspect. But in fact the study, once revised, showed a similarly significant composite reduction in risk for heart attacks, strokes and cardiovascular death. When Allbaugh and his team recorded the dietary habits of Cretan households, most survey respondents listed meat as their favorite food. But in reality, the people of Crete almost never ate it. That’s because producing meat is costly, both financially and environmentally. Behind the large amounts of meat in the American diet are the roughly one trillion pounds of corn and soybeans American farmers grow every year. This ocean of grain and beans is mostly used to feed livestock in the United States, but a rising percentage of it is exported to China. Planting corn and soy, year after year, depletes soils, and the fertilizers used to prop up those exhausted lands wash into surrounding watersheds, degrading drinking water and driving the formation of coastal dead zones. Now, as China prepares to slap a 25 percent tariff on American corn and soybeans, policymakers might think about shifting our agricultural production away from feed for animals and toward food for American humans. If America were to diversify its crops and plant more small-seed, cool-weather grains like oats (which also may reduce bad cholesterol), it would go a long way toward locking in healthy soil and limiting erosion. Farmers might even embrace emerging crops like kernza, a deep-rooted perennial grain developed by the Land Institute in Kansas that can be harvested in successive years without replanting. Why aren’t Americans being more daring with their grain choices? Subsidies. Crop insurance, which accounts for $8 billion in annual Department of Agriculture expenditures, is easiest to get if you’re planting corn and soy. If the federal government were to shift toward a “whole farm” version of crop insurance — which covers farms and not individual crops — as the National Sustainable Agriculture Coalition suggests, it could make growing grains for human rather than animal consumption a lot less risky for farmers contemplating such a transition. Whole farm revenue protection has been available since 2015 but is still a tiny fraction of the federal crop insurance program. When I speak about putting America on a Mediterranean diet, what I really mean is a “Pesca-terranean diet” — that is, a diet where only a spare amount of animal protein is consumed and where that small amount comes to us from the sea. This is exactly what the Greek version of the Mediterranean diet looks like. How could America increase its fish consumption without destroying its oceans? Once again, China’s 25 percent tariff makes the argument for us. Even though Americans chronically under-eat fish and shellfish, American fishermen actually export about a third of the seafood they catch, usually to Asia. With tariffs now making exporting harder, we could redirect American wild fish to schools and other institutions that serve children — a good way to get the next generation of American eaters pointed in a healthier direction. Americans could also look to expand the farming of seafood. Yes, aquaculture can be problematic, but compared with landfood production it is, as the noted marine ecologist Steve Gaines put it to me recently, “consistently better and in many cases dramatically better than anything we do on land.” This applies to carbon footprint, freshwater consumption and the preservation of open space, especially when the creatures being aquacultured are filter feeders like mussels, clams and edible seaweeds. But with aquaculture, again Americans lag. The United States ranks 15th in total seafood pounds grown, 17th if you include seaweed, just behind North Korea. And no wonder: While the United States spends $15 billion to promote commodity crops, it spends less than $1 billion on all domestic seafood-related programs, both wild and farmed. 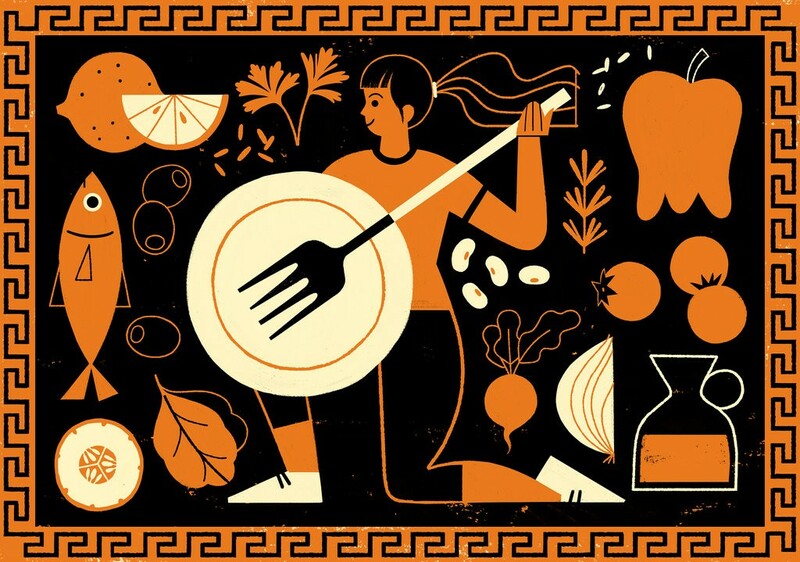 One of the reasons the diet of Crete was so high in leafy greens and other vegetables is that Cretan food culture evolved in a spare natural environment. “We are hungry most of the time,” one research subject lamented to Allbaugh’s team. It would be foolish to suggest that someone should somehow artificially deprive Americans of the processed food that they consistently favor over fresh fruits and vegetables. But it is worth trying to address the cultural inequity that healthier food options have in this country. The Cretan diet had the advantage of over 40 generations of “marketing” in the form of mothers who cooked and passed down recipes from household to household. Americans take their cultural cues more from memes than moms. In an era of intrusive, omnipresent advertising this has reached sinister degrees — for example the Frito-Lay “neuromarketing” campaign, which used brain scans to identify the guilty pleasure snackers take in having orange dust on their fingers after eating Cheetos. Currently Americans spend less than $5 million on school-based food- and farm-education programs annually — a fraction of what is spent marketing American fruits and vegetables that America exports to foreign consumers. Doubling food education programs would represent a tiny increase in a federal food program that today exceeds $100 billion annually. Policymakers could further shore up this investment by rebuilding infrastructure around produce. Before World War II, vegetable processing facilities could be found in nearly every state, and produce was just as likely to come from Sioux City as from Salinas. Now, “specialty crops” (as the Department of Agriculture calls all fruits and vegetables) are relegated primarily to a few coastal states and countries south of the border; Middle America is largely given over to grains. This environmentally vulnerable concentration dangerously extends already stretched resources in water-insecure places like California and Florida. A rebalancing of fruit and vegetable production to the relatively water-rich (and soon to be much warmer) Midwestern states makes a lot of economic and environmental sense. But before Americans throw up our hands and follow the modern Greeks into dietary Hades, it’s worth considering one last target: the health care system. Changing the country’s diet would be a much cheaper alternative to continuing to treat chronic disease after the fact. The United States now spends more money per capita on health care than any other country on earth, and Americans appear to be no healthier because of it. With a Mediterranean eating pattern more central to their lives, they could chart a middle path where diet and medicine are two halves of a healthier, more balanced whole. “Let food be thy medicine and let medicine be thy food,” Hippocrates is credited with saying. Amen to that. And pass the olive oil.